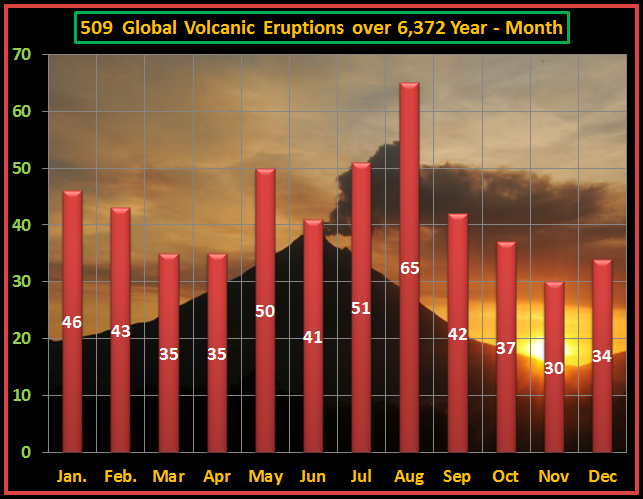 6,372 Years of Global Volcanic Eruptions. | Chaos Sweeps Away the World We Know! The Disaster, current events & Catastrophe Blog. Forecasts for 2014 to 2022. Read tomorrows news today! Plus current economic, commodities, stock indices and financial news. ← Rainstorms Flood Sichuan Province in China. 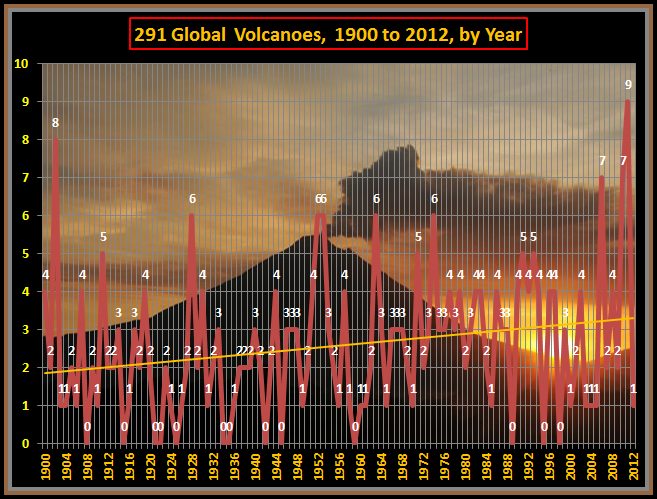 July 12, 2013 – 6,372 Years of Global Volcanic Eruptions: I downloaded all volcanic eruptions, from 4360 B.C. to 2012 A.D.; which is a total of 6,372 years. 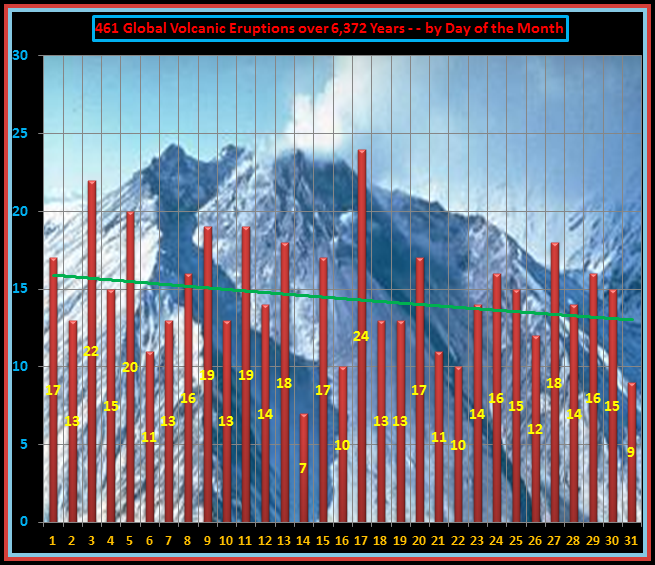 I graphed the volcanic eruptions by VEI (Volcanic Explosive Index), which is displayed above. 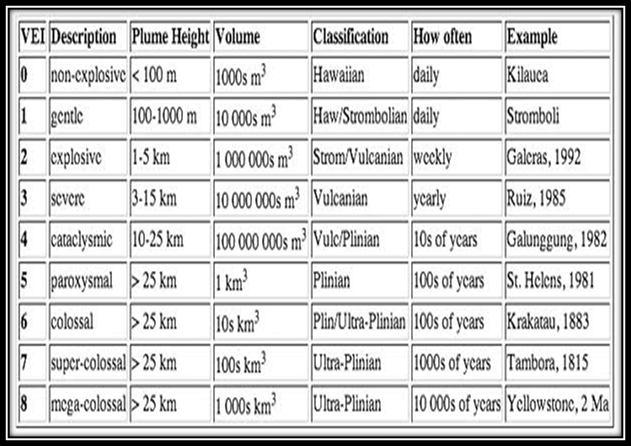 Only 540 of the volcanoes in the NOAA database had VEI ratings, out of a total of 614 events. Volcanoes and earthquakes are related in that the tectonic plate boundaries that cause most global earthquakes are also responsible for most volcanoes. 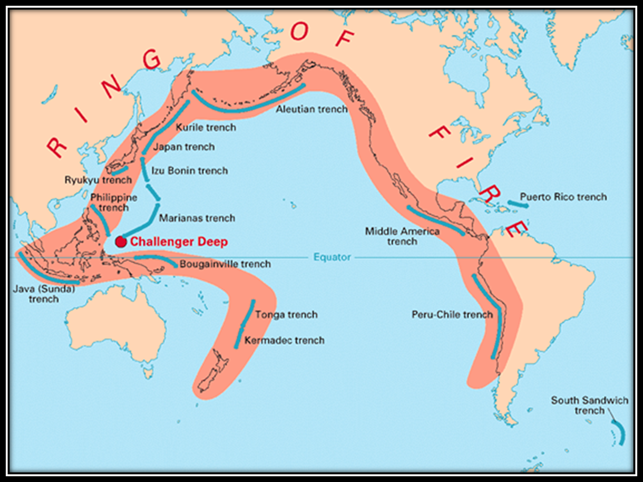 The belt of volcanoes that surround the Pacific Ocean and the “Ring of Fire,” contains about two-thirds of the world’s active volcanoes. Of the 614 events in the NOAA database, only 509 had a month listed. The unusual thing about this chart is that the high of 65 for August and the low of 30 for November are beyond two standard deviations from the mean, which puts them in the statistical oddity category. Again, each research answer leads to ten new questions. The low of 7 eruptions on the 14th of the month and the high of 24 eruptions on the 17th of the month are outside the statistical reasonableness. Something else is at work here. Volcanoes can cause destruction in more ways than earthquakes: the blast itself, avalanches, lightning, floods, gas emissions; indirect deaths from disease, starvation, exposure and desolation; lave and mudflows, pyroclastic flows, ash, bombs, steam blasts, and tsunamis. The average per year is about 2.5. The exponential trend line is slopping up. The last seven years on the graph show the following number of eruptions per year: 2006 = 7, 2007 = 2, 2008 = 4, 2009 = 2, 2010 = 7, 2011 = 9 and 2012 (thru April 13th) = 1. It looks like world-wide volcanic activity is increasing at an alarming rate. Other cycle information supports this conclusion. This entry was posted in Argentina, Australia, Chile, Disasters, Ecuador, Iceland, Indonesia, Iran, Iraq, Japan, Mexico, Misc, Miscellaneous, Nature, New Caledonia, New Zealand, News, Papua New Guinea, Peru, Philippines, Russia, Samoa, The Kingdom of Tonga, The Ring of Fire, The Sandwich Islands, The Solomom Islands, United States, Vanuatu, Venezuela, Volcanoes and tagged 6000 years of volcanic eruptions analyzed by VEI - Volcanic Explosivity Index - number of eruptions by month, april 15 2012, by day of the month, The Master of Disaster. Bookmark the permalink. 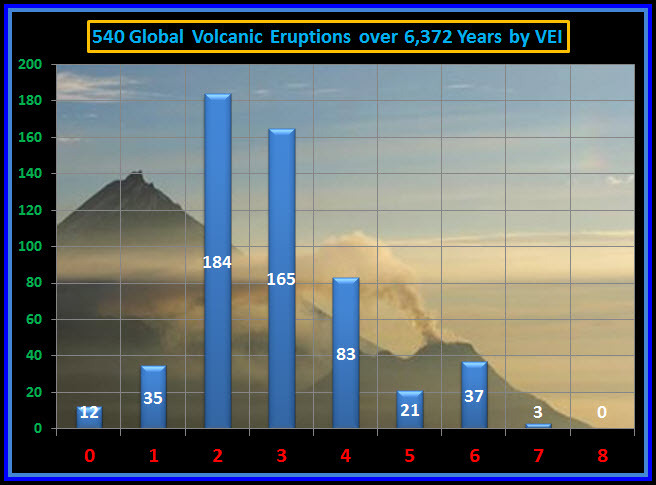 4 Responses to 6,372 Years of Global Volcanic Eruptions. I have done correlation analysis’ with earthquake data, which leans itself more to an accurate analysis since the sample size is so much larger. For example, I did a correlation test between the yearly quantity of earthquakes, from 1973 to 2011 – greater than or equal to 6.0 magnitude – and the reults were terrible. The sample size was 5,311 quakes over 39 years and the correlation r% was -39.9%. That means their is a moderate negative correlation but it’s really meaningless. Perhaps a monthly study would prove to be more accurate, but looking at the monthly data I don’t think so. Perhaps a decade study instead of a monthly study. It might more closely correspond to sun spot cycles. I did 39 years, using 5,311 earthquakes >= 6.0 magnitude – that’s almost four decades.